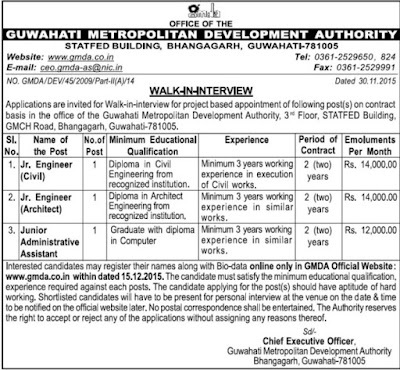 Application are invited for Walk-in-interview for project based appointment of following post(s) on contract basis in the office of the Guwahati Metropolitan Development Authority, 3'd Floor, STAFED Building, GMCH Road, Bhangagarh, Guwahati-781005. How to apply: Interested candidates may register their names along with Bio-data online only in GMDA Official Website: www.gmda.co.in within dated: 15/12/2015. The candidate must satisfy the minimum educational qualification, experience required against each posts. The candidate applying for the post(s) should have aptitude of hard working. Shortlisted candidates will have to be present for personal interview at the venue on the date & time to be notified on the official website later. No postal correspondence shall be entertained. The Authority reserves the right to accept or reject any of the applications without assigning any reasons thereof.